Avocado Banana Double Chocolate Chip Frozen Custard. And other Sweet Ideas. Tomatoes and Avocados as sweets? Yes, these “faux veggies” deserve a second look. Their versatility practically begs us to play around and find new ways to use them. Who’s to say there aren’t other potentially fantastic “double agents” just waiting to be discovered? Another of my favorite tapas from Mercado de la Reina (see Sobrasada with Brie) is a slice of toasted bread topped with a sweetened tomato jam and a slice of soft goat cheese. Given that the tomato is, in fact, a fruit, this shouldn’t have surprised me the first time I tried it. But, it did. Cherry and grape tomatoes tend to be the sweetest. The recipe for my recreation of this yummy tapa coming soon. For now, I bring you some ideas for cool concoctions with that clandestine fruit, the avocado. Thick, sweet, and retaining its avocado flavor, I can say I have never tasted anything quite like it. All in all, I liked it. If only I had stopped drinking when I was full instead of challenging myself to the full glass. 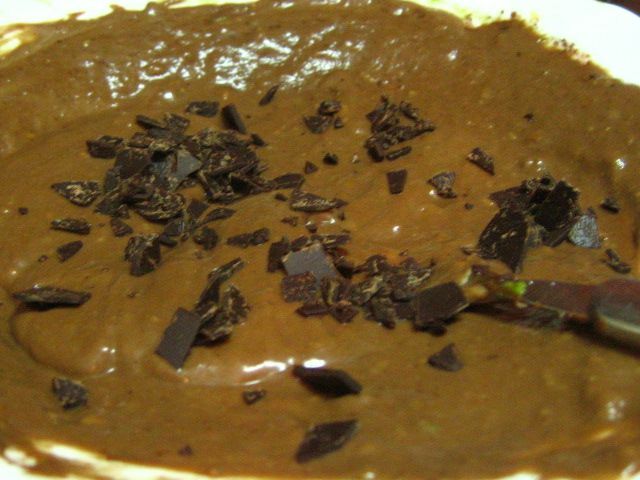 I have since thought of other ways to incorporate avocado into mousses and other desserts with less… avocado-ey intensity (see below), and I highly recommend it as a daring and different addition to your home menu. If you don’t want to mix the sugar and water to make the syrup, you can substitute honey. And I recommend adding ice cream or yogurt. And maybe a banana if you’d like. The Moroccan avocado experience opened my eyes to utilizing the remarkable dexterity of the avocado is as a dessert. The Philipines, Brazil, and many other countries also know the secret bliss of the sweetened avocado in shakes as well as in ice cream. 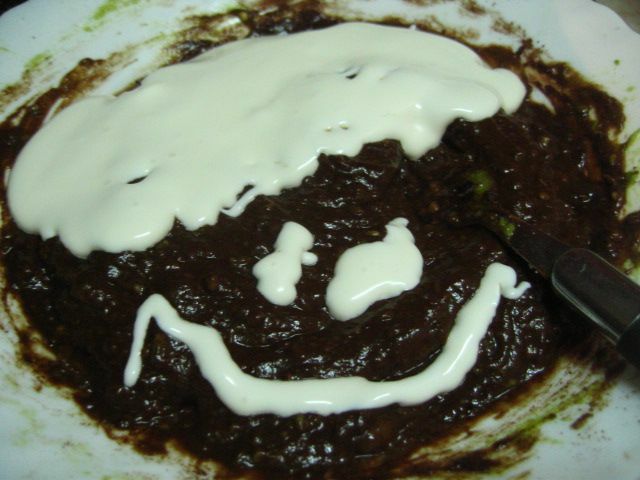 There are also some intriguing recipes online for avocado lime pies and avocado chocolate mousse and pudding, but I wanted to do something different. Something that combined the elements of avocado, banana, chocolate, and frozen summer treat. With chocolate chips. Maybe this isn’t the most surprising thing, since my favorite gelato flavors are mint chocolate chip and double chocolate chip. So avocado chocolate chip it is. By far one of the most delicious things I have ever made. And the only equipment I used included a fork and a bowl. Of course, if you have a blender or processor that would make the texture slightly more consistent. But it’s absolutely not necessary. The one thing that surprised me–and made me kind of happy in a weird “Look at me, I’m a crazy cook” sort of way–was that I could not find any recipes like it already on the internet! 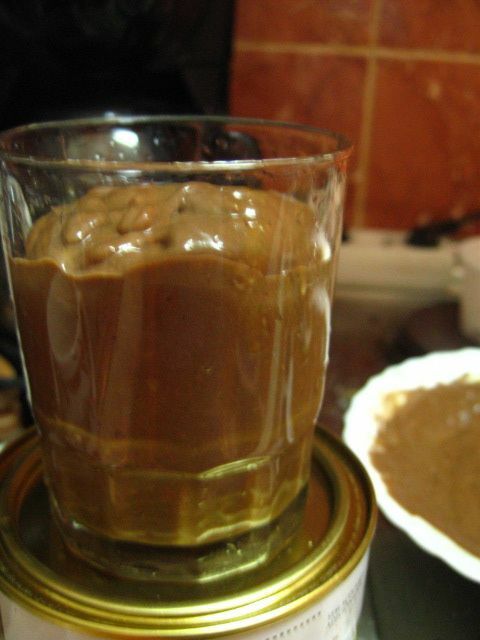 Mousse, pudding, ice cream, yes, but not everything together. (This is also a lot easier than the ice cream because you don’t need a machine.) It’s the little things, right? So this is how it goes, I think you’ll be surprised at how easy it is! If you want to make it less chocolatey (although I can’t imagine why! 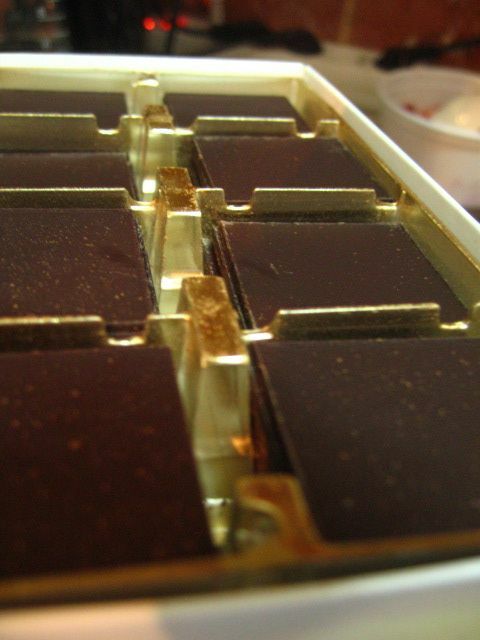 ), use either less cocoa or omit the cocoa altogether. Play around with it! And this time… I have tons of pics! Preparation time: About 10 minutes to mix ingredients, plus freezing a few hours or overnight. Servings: 2-4, depending on how large your serving cups are. 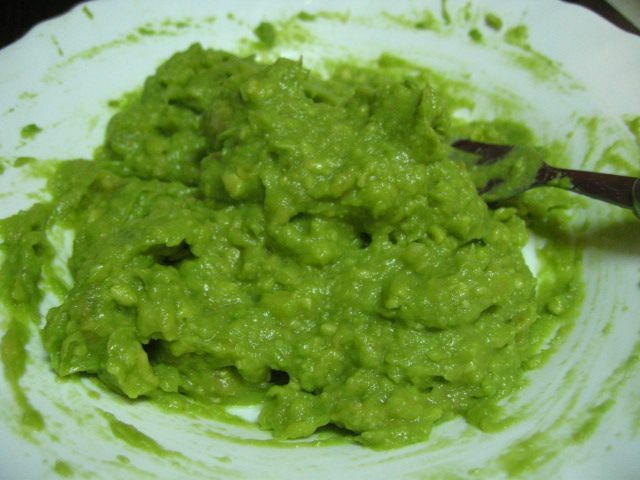 Mash the avocado, banana, and lemon juice in a bowl with a fork or else in a processor. No, it's not guacamole. It's avocado and banana mush. Add the cocoa, sugar, and honey and continue mashing/processing. Add the creme fraiche last. Adding the creme fraiche. OK, maybe I had a little too much fun with it. Grab the chocolate thins in one hand and break them into little bits by squeezing your fist a few times (yes, it really is this easy). Fold them into the mixture. The most nutritious chocolate treat... ever? Pour mixture into parfait cups or, if you are at a loss for pretty display glasses like I am, just use regular old drinking glasses, if they can be frozen. Freeze for several hours or overnight. You should end up with a gelato-like, nutritious, delicious banana double chocolate chip frozen custard. I am in love with it. Enjoy! NOTE: The frozen gelato-like texture may be somewhat difficult to achieve as the ingredients can tend to “overfreeze,” making long thaws necessary. I am going to play with some ingredients (no milk though) to see how to improve this. For now, my suggestion to get the perfect frozen texture is to pop it in the freezer for about 3 hours after making to achieve the texture, then transfer to the fridge for 3-4 hours for storage before serving. Longer freezing time may require longer thawing time. If you only keep it in the fridge instead of freezing, you will achieve a very rich pudding instead. Could also be used as pie filling–seems to have gone over well that way according to other recipe blogs! However you serve it–it’s delicious! Hi! It is a good recipe and I like this dessert. I added more honey and cocoa. 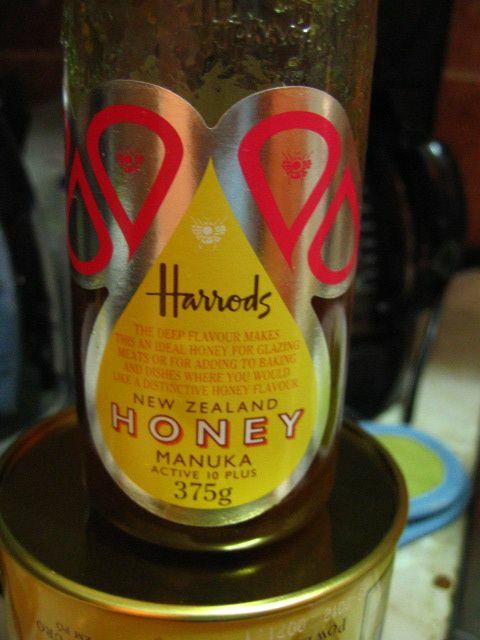 The honey was from almond tree and tastes hard but good. I added more among because all mixed tasted to much banana. It was also good, but I wanted something different and I got it so. Lonnie Aaby on Armenian Walnuts! Global Food Fusion © 2019 All Rights Reserved.